Traveling and experiencing cultures often leads to a meal you once thought you would never attempt. It can mean sampling of the local delicacy usually made up of items most people can digest or something totally bizarre like eating fried insects in Thailand, cured horse heart in Budapest, or wood worms in the Philippines. I was reminded of my situation when Ben from HugeTravelParty asked for stories on the topic of “I can’t believe I ate/drank that”. My personal experience with a bizarre food was on November of 2014. 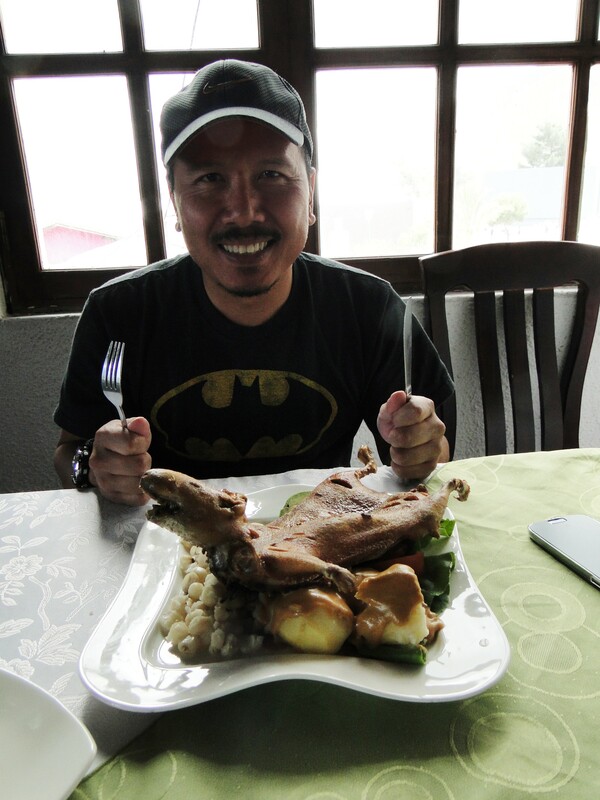 I was in Quito for my birthday when I decided to try the cuy (kuwe), or fried guinea pig. A unique food, to say the least, that my Ecuadorian coworker had dared me to try. I knew my friends back home would frown upon this, and they did, so I created the story that cuy was “the birthday meal of Inca kings”. If this was good enough for kings, it was good enough for me. Somewhat believable, right?! Yes, it’s recognized as a pet which makes it taboo to eat, but in Ecuador and Peru it’s considered a delicacy. My guide also convinced me to eat the head! He said it doesn’t count if you don’t eat the head. I would eat it again without consuming the head, which was a one time thing. ”Does it taste like chicken?” you ask. No, more like a suckling pig but a little bony. Do you have a bizarre food story? tell me about it. This is so cool ~ I think there is nothing better than tasting the local cuisine to get a nice feel for the culture 🙂 And to be honest, it looks pretty good on your plate and if it is “the birthday meal of Inca kings” then I agree, it is worth a try. Great post! Thanks. I’m not that adventurous when it comes to food but I’ll try anything friend, at least once. Omg can’t believe you ate that!!! haha. The head looks like a little baby dinosaur lol I’ve tried wood worms in the Phils and crocodile meat but that’s as far as I’ve gone. Very brave, good on ya mate. The first thing I thought it was the BAYAWAK but when I read your story it’s more blizzard on your birthday one guinea pig , oh man you have all the guts to consumed it.